The California State University, Northridge Opera Theater enjoys a long-standing reputation as one of the finest university opera programs in the United States. Currently the opera program is under the musical direction of Mercedes Juan. We take great pride in exposing our students to a number of stage directors with vast expertise in stage directing and acting. Most recently our productions have been directed by Maurice Godin, Ray Saar, Garry Lennon and Eli Villanueva. This tradition of excellence was set I motion under the 30 year directorship of David Scott and former opera directors David Aks and John Roscigno. The CSUN Opera program puts on two full productions each year accompanied by the CSUN Symphony Orchestra. Past seasons included highly successful runs of Nicolai’s Merry Wives of Windsor, Humperdinck’s Hansel and Gretel and Bernstein’s Trouble in Tahiti. We often perform the great works in their original language. Some other memorable recent performances include Don Giovanni, Carmen, Orfeo and Euridice, and The Medium. Opera study at CSUN includes classes in studio voice, diction, repertoire, performance techniques, opera scenes, Alexander Technique and of course the full productions. These courses, combined with CSUN's excellent musicianship classes, produce performers who are musically advanced, vocally healthy, physically and emotionally centered and skilled at a naturalistic style of acting that is the hallmark of CSUN's opera productions. 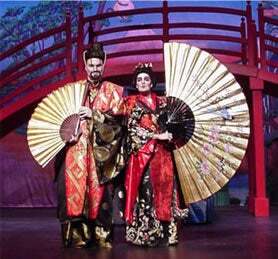 Graduates of the CSUN Opera Theater have gone on to major national and international careers. Prominent alumni include soprano Carol Vaness, mezzo-soprano Michelle DeYoung, soprano Shigemi Matsumoto, tenor Beau Palmer and soprano Sarah Joy Heerema, who recently appeared as Mimi in Baz Luhrmann's Broadway production of La Boheme. CSUN opera students have gone on to study at such institutions as Juilliard, University of Southern California, Boston University and the San Francisco Conservatory.